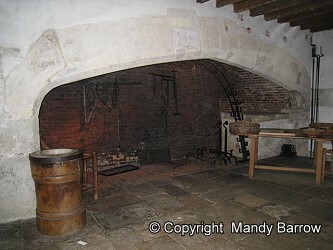 Hampton Court Palace is a great place to see what Tudor kitchens looked like. Henry Viii built gigantic kitchens to feed the many hundreds of members of his court. That meant two meals a day for at least 800 people! A list from the reign of Elizabeth I reveals the quantity of meat cooked in the royal kitchens in one year; 1,240 oxen, 8,200 sheep, 2,330 deer, 760 calves, 1,870 pigs and 53 wild boars. 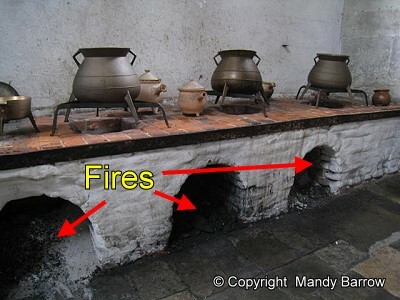 In Tudor times, kitchens were built away from the dining rooms because of the risk of fire. Liveried serving men would collect the finished dishes from the kitchens and take them to the Great Hall where Henry and his court ate. There were no microwave ovens nor electric or gas cookers five hundred years ago. Cooking was mainly done on fires. 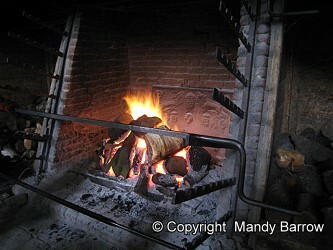 The fireplaces in a Tudor kitchen were huge. The Great Kitchen at Hampton Court had six fireplaces. Meat was cooked on a spit (metal pole) in front of the fire. You can see the spit-racks the metal poles were put on. 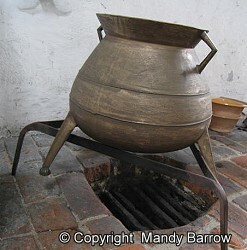 The cooking pots were placed over holes in the work surfaces.